What if you knew that athletes commonly make sprinting mistakes that are often reinforced by coaches and that cost the athletes speed performance? As a coach who has worked with both college and youth track & field athletes, I can tell you that bad habits are often instilled early and never corrected by training specialists who just don’t know any better. With that, here are 5 common speed training mistakes, and how to address them for ultimate speed. Ever been to a speed training session? If so, there is a good chance you’ve heard the phrase “get your knees up!” quite a few times. Knee drive is an aspect of sprinting that fluctuates. What is constant is the powerful drive of the glute, which locks the sacrum during ground strike. Vertical force production is also constant (although athletes naturally run with varying levels of “tallness”). Athletes do need to drive their knees somewhat during sprinting—at least enough to balance out the rotational forces that occur from their legs swinging back and up after they push off the ground. There should be a balance between the motion of the legs in front of and behind the body during sprinting. I talk about the fluctuation aspect to show there is not a prescribed amount of knee drive that is optimal for all athletes. Unfortunately, simply telling athletes to “get their knees up” when they sprint has unintended biomechanical repercussions that negatively influence the athlete’s speed potential. I’ve never told an athlete to sprint “with high knees” and then seen him improve his speed. Although it might look better (to the untrained coaching eye), consciously driving increased knee lift comes at the expense of other aspects of sprinting, such as hip push, leg plant action, and other important mechanics. Athletes always compensate their way to better knee drive when told to do so, often at the expense of vertical ground forces. For the best example of this, watch a group of 10-year-old track athletes sprint with their knees high and notice the biomechanical chaos that ensues. 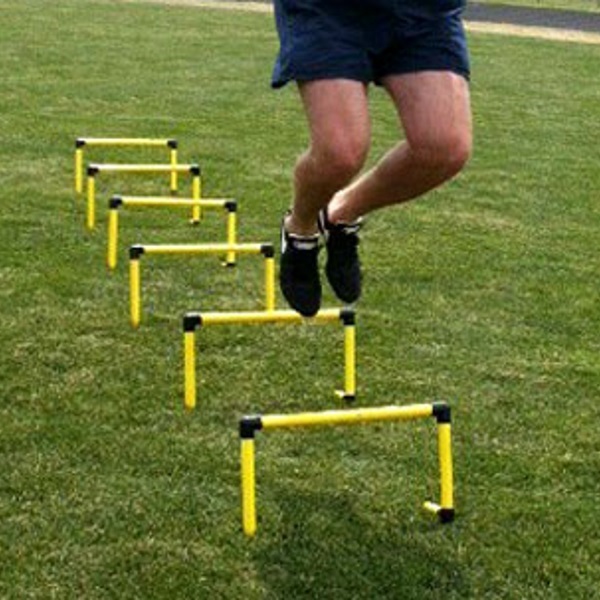 One of the best ways to correct struggles with balance between frontside and backside mechanics in regard to knee lift is to sprint over mini-hurdles, or wickets. This allows athletes to let their brains configure the best pattern to make the most out of what their body has to offer in sprint movement—with extra emphasis on stepping over hurdles, rather than simply getting their knees up. Wickets allow a much more fluid athletic movement than of simply cueing the knees higher. Wickets work by subtly and subconsciously encouraging the athlete to project the hip of the swing leg harder (not so much the knee), which causes better knee action automatically. The video below, shot and narrated by a coach from the elite track & field group “ALTIS,” describes this drill in more detail. By performing a strength regimen focused around hip-based movement, proper breathing, relaxation of the extremities, and a balance of dynamic and static muscle contractions, athletes can improve the patterns they take with them from the weight room to the field. Much of what is seen in modern strength programs helps speed on the level of intramuscular power, but it can harm speed in another way. Care must be taken in building a proper resistance-based program. To accelerate, athletes need to be able to push the ground backwards. Once an athlete is upright and moving at maximal velocity, it’s all about vertical ground reaction forces. Unfortunately, most coaches don’t cue and coach this portion of sprinting with enough intent and appreciation. One important aspect of vertical force production is that you can only really train it well in a fresh state. Vertical force production is very difficult to train and overload when an athlete is tired. This being said, to get faster, you must build the training program around working speed with maximal intensity, and then be sure not to train again too early. It is better to undertrain maximal speed than overtrain it. The Depth Jump Over Hurdle is a nice way to build vertical power for sprint performance. Just be sure to keep brief ground contact times. All we want to do is Squat and Clean. We rarely spend time looking at things like dorsiflexion in building acceleration and lateral speed, and hip function in training maximal velocity. When an athlete is slow, it’s unfortunately true that many head coaches blame the strength coach, or genetics (they may have a case here), or some random aspect of sprint technique to explain it. The truth is an immense amount of available speed is lost in hip and foot function. The inability Squat twice one’s body weight doesn’t mean anything when it comes to not being fast on the field. Having good hip and ankle strength means everything. Bottom line, you must have great hip and foot function to be truly fast. A nice strength exercise that also demonstrates how the hip elevates to allow better swing leg mechanics is shown in the video below. A favorite saying I’ve heard regarding speed, from Illinois sprint coach Tony Holler is: “If you aren’t in spikes, then you aren’t sprinting!” This is clearly more true for track athletes than team sport participants, but it speaks to the idea that unless you are regularly replicating the highest speeds your sport has to offer, you aren’t going to get any faster. I also endorse the idea that “you can’t improve what you don’t measure,” made popular by Christopher Glaeser of FreelapUSA. Essentially, if you are training speed, but never time or measure your performance, your brain will never understand what you are trying to accomplish. I can’t imagine coaches and athletes who would lift weights and never pay attention to how much they had on the bar. Our bodies work in concert with our subconscious mind. If there is no outcome goal, there is nothing for the subconscious mind to understand and adapt the nervous system toward. In many cases, however, racing can take the place of timed sprints, due to the nature of speed. If you are running as fast as you can against teammates or competitors, your body understands the purpose of what you are doing. Alternating racing and timed efforts (or combining them) is an excellent strategy for getting faster. When it comes down to it though, unless you are sprinting as fast as you can in your specific sport environment (and gear), and timing or measuring each effort, you aren’t really training speed.